They have 8 years of professional consulting experience in the US. But, instead of working from their offices in Colorado, they’ve spent the past 5 months providing pro bono service to volunteer and civil society teams helping refugees. Below, they share their experience volunteering with grassroots organizations in Greece and Serbia. There are many grassroots teams, from informal volunteer groups to small local NGOs, who have long been on the ground striving to improve the lives of refugees stranded throughout Europe. It’s incredibly important and fulfilling work to meet the basic needs of those who cannot do so for themselves. There is also a solid pool of volunteers ready to do that work. how do you create structures & processes that respect the flexible and informal nature of grassroots teams but make operations smoother without stopping your work? This is where someone with experience can come in, give a new perspective and use their skills to create the tools or processes that can make a team work more effectively. Working in the background to support grassroots team’s growth may not come with the same emotional stimulus as working directly with refugees, but in the end, I believe it can have a broader impact. And there are still plenty of warm fuzzies to be had when a team coordinator (who has given every waking hour bringing dignity back to those who have lost it) is profusely thanking you for saving their sanity via a basic process flow. In our 5 months working with Campfire Innovation, we facilitated strategic workshops, advised teams on long term planning, guided process improvement discussions, evaluated teams’ communications strategy, and built several financial and volunteer planning tools. All in an effort to support these teams in their transition into a sustainable grassroots organization. There are some extremely interesting challenges wrapped up in this pro-bono, capacity building type of volunteering. Many teams still desire to operate in a flat structure involving the entire team in all decisions. Many teams have a rotating string of volunteers with new people starting and leaving each week. Other teams are caught in a cycle of setting up one new project after another without fully optimizing what they already have in process. Openness, flexibility, humility and simplicity are the keys to making a difference in this dynamic environment. Basic needs must still be met, refugees still need new shoes, winter coats and daily meals. But as the “refugee crisis” transforms into a long term problem, the teams supporting it must transform as well. The necessary change: Teams that once started as small groups of volunteers banding together to fill a gap quickly became committed grassroots teams. Those teams now need to shift with the situation again and transform into sustainable organizations. Why it’s challenging: Most of the team leaders have been operating in a world where their daily activity consists of putting out one fire after the next. This transformation will include strategic planning, process improvement, and diversified fundraising etc.. All of which require these leaders to shift their approach from filling gaps to proactive planning. Openness to support: Grassroot team leaders and project managers are ready and willing to do this new work. Many just need a little guidance or simply someone who has the time to help work on these long term and administrative topics. There is currently a high demand for volunteers who can support teams in their efforts to transform into sustainable organizations. 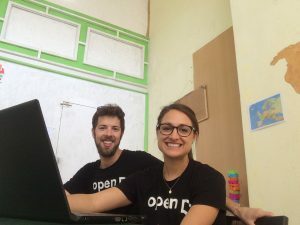 CAMPFIRE Innovation also benefited from Kyra and David’s pro bono volunteer service, and is beyond thankful for their dedication to grassroots organizations providing services to refugees across Europe. If you’re interested in sharing your expertise and volunteering with the grassroots community in Greece check out CAMPFIRE Innovation’s Pro Bono Experts Program and apply today! The Pro Bono Experts program is open to all professionals interested in volunteering their services to grassroots organizations providing refugee aid. Projects last for 2 + weeks and CAMPFIRE Innovation provides on the ground support to all volunteers. The application process is free. Volunteers cover accommodation/food/travel costs. CAMPFIRE Innovation can provide recommendations for accommodation and travel advice upon arrival in Greece. Email experts@campfireinnovation.org to share your CV/ resume or reach out with any questions.